Gabriel of Urantia and Niánn Emerson Chase are the physical embodiment of spirituality and leadership. They are spiritual elders, leaders, pastors, teachers, counselors, authors, community builders, and EcoVillage and sustainable living pioneers. 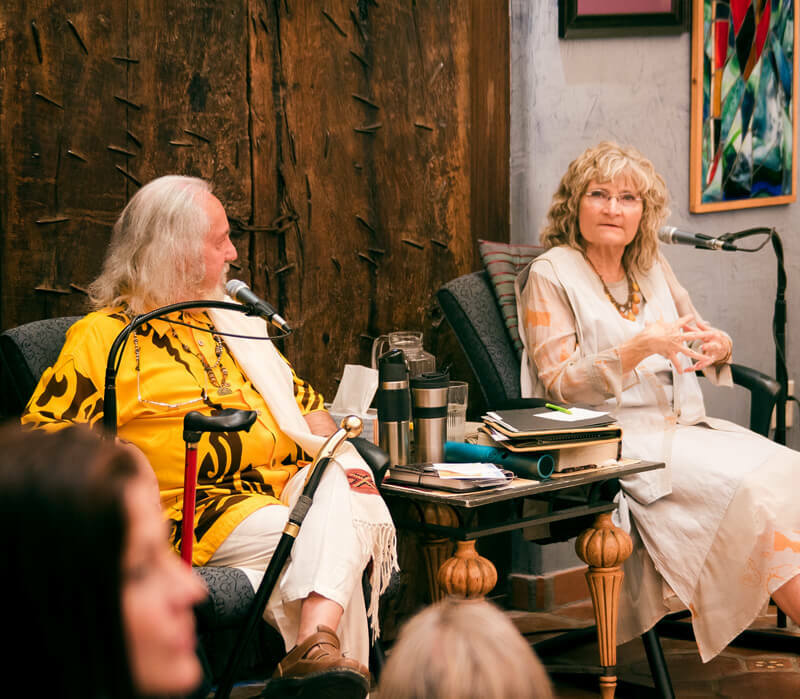 In 1989 they founded Global Community Communications Alliance—currently a 120+ member spiritual community and school, temple and working EcoVillage (at Avalon Organic Gardens) located in southern Arizona in the historic southwest towns of Tubac and Tumacácori. Together they are the Head Administrators of a Divine Administration, an innovative spiritual concept of Government. Additionally they serve as the Executive Directors of the Alternative Voice, an international periodical, which fuses spirituality and leadership with activism—a pioneering idea that has inspired many other leaders. Gabriel of Urantia and Niánn Emerson Chase are spiritual elders who have been proactive in the spiritual, social, and environmental arenas for decades, standing up for justice and godly social service. Together they hold the Mandate of the Bright and Morning Star, a spiritual mandate focused on creating global change to assist our planet's shift into higher levels of consciousness, increased cooperation and a global sense of responsibility for each other and the world. Their Global Change Teachings present very real solutions to bring about global change through spiritual unity, without uniformity. The following social outreach programs have been founded by Gabriel of Urantia and Niánn Emerson Chase. For more information visit http://gabrielofurantia.org/visionary. Camp Avalon offers Sedona's only private creek-side campground on the renowned Oak Creek. For over 25 years, our grounds have hosted community events and church gatherings and have been the destination of international pilgrimages, with people coming from around the world to connect with the Earth and the Creator amidst the special environment of Camp Avalon. Global Alliance Properties' boutique lodging & rentals are a delightful alternative to typical hotels with properties in Sedona and Tubac, two of Arizona's most popular locations for history, hiking, and art. Promoting lasting health through holistic therapies in Tubac, Arizona, including massage and acupuncture and specializing in aqua therapy sessions in our 5 chlorine-free and chemical-free ionized pools. Serving souls in their final phase of life in recognition that this time holds tremendous potential for emotional and spiritual growth for all involved. Helping people bring their positive ideas and services to the world through our media networks, creative agency, media consultants, brand specialists and pro-audio/video productions. The new alternative, new-thought, progressive nonprofit record label offering musicians recording opportunities using professional world-class equipment for voice and instrumental training. The Sea Of Glass - Center For The Arts — A center for global change through higher consciousness. International bands and speakers in a sacred environment. State-of-the-art recording studio with retreat facilities for bands in a sacred environment providing organic meals. Producer and studio musicians available, if needed. Your alternative, new-thought, progressive community radio network. KVAN is visionary radio. Online at kvan.fm. Publishing continuing epochal revelation and related materials as well as Global Change Teachings and other spiritually-oriented texts. Quarterly periodical addressing the many crises of our world and offering hope by fusing spirituality with activism with revelatory information and answers. Providing opportunities for musicians to communicate their musical messages without spiritual compromise. Writing, producing, and performing plays and musicals designed to stir and inspire the soul. 220-acre organic farm and ecovillage offering residential and internship programs so visitors and Resident Visitors can learn and experience sustainability, community life, and permaculture practices. A year-round home school cooperative with preschool through high school classes focused on the development of the whole personality and nurturing the latent potentials of each individual child's artistic and creative capabilities. The only children's school that deals with the point of origin (universe) and the age of the soul. Enlightening tours for the seeking sojourner and eco-tourist. Serving Sedona, Tucson, and the Tubac / Santa Cruz River Valley, Arizona. Boutique providing Fair Trade, ethnic, and eclectic clothing, jewelry, fine art, rare spiritual books, and more with locations in Tucson and Tubac, Arizona. A residential program at Avalon Organic Gardens & EcoVillage in Tumacácori, Arizona, where accepted homeless are incorporated into residential & family housing where a variety of vocational skills can be learned. Hands-on training apprenticeship programs in a wide range of career fields. Nonprofit legal services in various fields, particularly immigration and domestic cases. Pursuing peace and justice through advocacy. Providing cleaning, landscaping, and other services to create, embellish, and bring godly energy to the environment. Niánn Emerson Chase is a world-renowned spiritual leader, educator, activist, and a prolific author with many articles on culture, society, spirituality, and sustainability. Books, music, and articles by Gabriel of Urantia and Niánn Emerson Chase can be purchased through the University Resource Center.